It has been a while since the Leeds Rhinos vs Bradford Bulls game has been the event of the season, back in 1999 it set the then Super League attendance record of 24,020. That game was at Odsal, the same fixture last year attached a crowd of just 14,554. This change is down to a few factors, one been that Leeds Rhinos have been the dominate team for the last 6 years and the other that Bradford have slowly slid down the league and haven't won a trophy since 2005 meaning they have lost a portion of their fair weather fans. 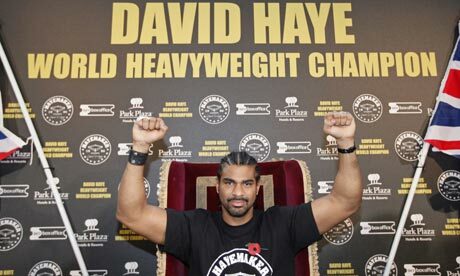 Britain's World Heavyweight Boxing Champion David Haye has the first defence of his title in less than two weeks in Manchester against the American John Ruiz. Many British boxing fans are looking at this fight as a formality, a routine first defence for Haye, nothing more than a stepping stone for unifying the Heavyweight division of boxing. That alone would be disconcerting, but what is even more so, is that Haye seems to be of a similar mindset.